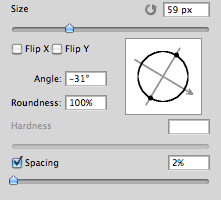 This reply was created from a merged topic originally titled Photoshop: Real-time, hotkey control for Brush Rotation. As a workaround, I use a spring-loaded shortcut as it's faster than jumping back and forth to the panel... basically, instead of rotating the brush angle I rotate the canvas. With the brush (or other tool) selected > press and hold the R key > rotate canvas as needed > let go of R key and you're right back to the brush. To reset view, just press & hold R key then click Reset View on toolbar. Spring-loaded tools are great for when you need to temporarily switch tools for a quick edit, just press and hold the keyboard shortcut. Release key when done with edit and you jump right back to previous selected tool. A faster way to reset the view is to simply press the esc key. Great idea Julie and thanks to Aicel for additional tip. Why can't your brush stroke automatically rotate itself as you brush. Unity 3d's brushes do, why can't this? It's a simple feature really...and much needed! You mean like dynamic brush strokes? But that isn't all that controllable. I thought what the OP wanted was control over when the brush rotated, as he asked for degrees of rotation per key press. I've not used Unity 3D, so don't know how that works. How is it automatic but you control how much the tip rotates? This reply was created from a merged topic originally titled Photoshop 2019 Possible New Features. I think the clone stamp and healing brush can have a simple improvement, check the image for the description, what do you think ? The previous version had some issues; there is a newer version although I'm not aware on if all the issues from the previous versions reside. This looks like works for the brush and eraser. Does it work with the Clone and Healing brush tool ? This does NOT work for me. All it does is change the brush size. This tool is not worth the money; I hope you did not purchase it. The author needs to fix this program by going back to the drawing board. Just adding my voice to this request. Rotating the entire canvas is a poor workaround. If you can do this for the clone stamp, you can do it for brushes. PLEASE!!!!!!!!! I've already voted and they won't let me vote again. (frowny face<G>) I use a lot of brushes that really need to be rotated often, and Dynamic brushes, which are terrific, are not the solution for every time I want to rotate a brush. Right-clicking, twirling a widget, hovering to see the effect, dismissing the modal popup, all that interferes with a pleasant experience. It's bad enough that PS still doesn't actually preview the effect when we hover and before we use the brush (it can do that for Clone Stamp and Affinity always does that), but they have made a simple rotation of brush tip rather more complicated than easy. All built into using Brush settings or the widget, not just doing it. I want to point out that this is a function that has been requested since 2005, and that Adobe still has not implemented in the 2019 version, it is pathetic, I wonder what it is used to continue to pay a subscription, again a beautiful example of a software publisher that does not consider the opinion of its users, which I can pass on Affinity photo. I third it, and fourth it, and ..... ninety-ninth it! I've been asking for this for years now!